1 Private Class + 1 Group Class for $40! Why Choose World Class Martial Arts? What level of experience and what quality of instruction does the school provide? Is the training facility a good one—is it large, clean, and safe and is the equipment in good shape? Is the learning environment positive and encouraging? What are the training options—is the class schedule flexible? Is the school conveniently located and do the programs suit your needs? Are there special programs and events specific to the school? Your answers to the above will help choose the best martial arts school for you and your family. Master Yun is a graduate of YongIn University and has attained a 6th degree black belt with more than 30 years experience in Taekwondo. He has won many national medals for sparring in South Korea and has been teaching in the United States since 2001. 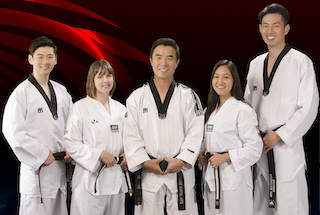 With his team of masters and quality instructors, Master Yun teaches focus, confidence, and respect through the self-defense techniques of Taekwondo. We take pride in the quality of our Taekwondo school. Our facilities provide a spacious, clean, and safe environment with state-of-the-art equipment for our students and families. "More than a school, World Class Martial Arts is a community of students, instructors, and family. Through the kindness and support of this community, I've watched my son grow in confidence and thrive. Some of his best memories have been made attending classes and events at the school. Thank you so much World Class Martial Arts!" We realize that today's families have busy schedules, and adding something new may be challenging. That's why we've designed our schedule with flexible class times in order to accommodate as many people's schedules as possible. Unlike other activities, you don't have to come to the same day and time each week. In addition to our regular classes we host numerous events for our students, including our holiday parties, sleep-overs, movie nights, school picnic, tournaments, special demonstrations, and children's birthday parties. Key to every event is that our students and families have fun with an organization they trust. We know the impact a good teacher can have on a student. Our instructors are patient and enthusiastic, and teach with a perfect blend of discipline and fun. With our low student-teacher ratio, every student receives personal attention. Our instructors are dedicated to helping all students achieve their best. The martial arts were developed thousands of years ago as forms of self-defense. While Karate originated in Japan and Kung Fu came from China, Taekwondo (which means "kick, punch, art") is native to Korea. In terms of techniques, Taekwondo emphasizes kicks more than other martial arts, making it ideal for improving your child's balance, flexibility, and endurance. Our experience has shown that children ages three-and-a-half and up will be able to take the greatest advantage from Taekwondo classes. Starting at age three-and-a-half, your child can participate in our Tiny Tigers Program. Our instructors will work with them one-on-one and evaluate their readiness for junior classes. Absolutely not. Your child will be taught from the first lesson that true "Taekwondo kids" never misuse their martial arts skills. Throughout their training, they will be reminded that being physically and mentally tough does not allow one to be tough with others. Instead, Taekwondo students are expected to be humble, courteous, respectful and careful about when and where they practice their skills. 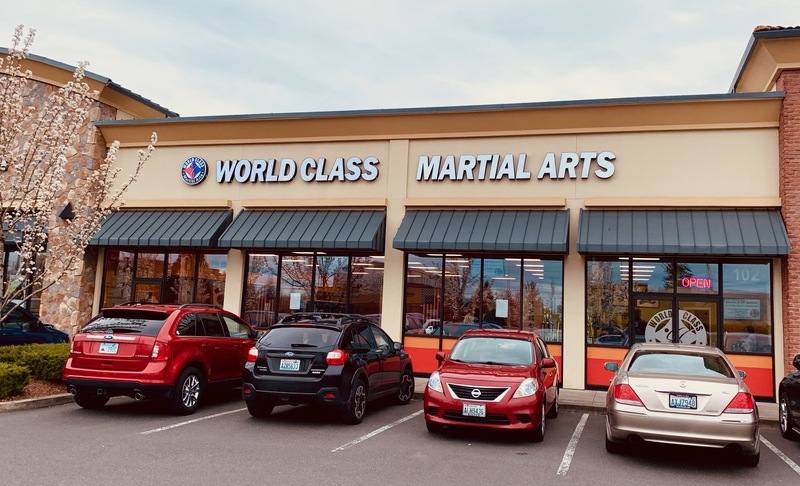 The instructors at World Class Martial Arts will continually educate your child that martial arts are a form of exercise and self improvement, not a tool for bullying. Yes. In fact, many families are finding Taekwondo to be the perfect family activity, combining an exciting workout with a new learning experience. You have your choice of attending children's and adults' classes individually or coming together to our family classes. Either way you'll have a great time and create a special family bond. Taekwondo is safe and fun for students of all ages and physical abilities. Classes are taught by expert instructors as students are shown techniques in a step-by-step manner at their own pace. A thorough stretching routine, matted flooring, and protective safety equipment are all part of our commitment to ensuring student safety. At World Class Martial Arts we have ongoing enrollment, so beginners are always welcome. Our Trial Program makes it easy for new students of all fitness levels to get started. New students receive one-on-one instruction designed to answer common questions and provide an introduction to the basics of Taekwondo. In addition, the belt system used in Taekwondo allows all students to train at their own pace and improve their physical condition gradually.